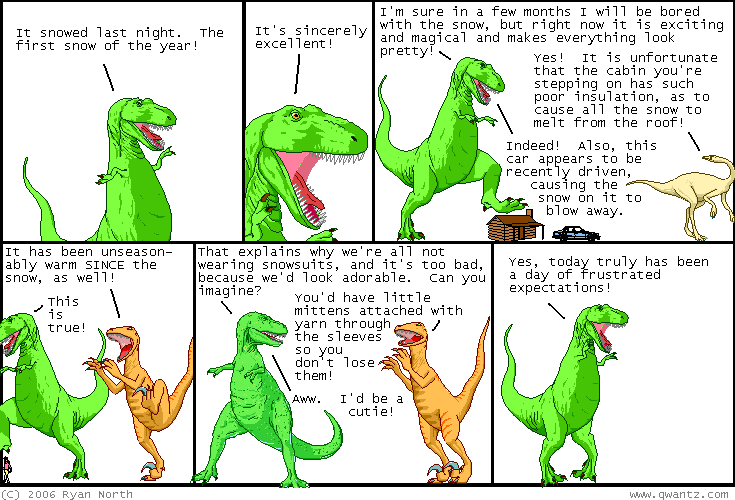 Dinosaur Comics - December 5th, 2006 - awesome fun times! –Looks like you dropped the ball, NLP researchers!! December 5th, 2006: So hey, you like awesome comics right? You know you do because everyone likes things that are awesome. My good friend Allene, who you know from her comics, as well as her adorable art in the Happy Dog book we did together which you can totally order for Christmas - she has some new books up for sale! They are mini comics incorporating her Portraits of Keara and Smartcrow stories. The latter is a comic about how crows are smart and steal each other's food, and you can get them both here. They are great little comics, and cheap! That is not a crow pun. Crows say "caw", not "cheep". David is auctioning off some Wondermark prints, with 100% of the proceeds going to Child's Play, a great charity established by the Penny Arcade boys, which helps to make the time kids spend in hospitals a bit less difficult. Child's Play is also a great charity because 100% of the money donated goes to the hospitals - any management costs are handled by Penny Arcade, which is fantastic. So if you're interested in pretty prints I would totally check out that auction! And you can always donate to Childs Play - it's as easy as buying a shirt because you can use PayPal. Hooray! David's auction(s) have given me ideas, and I'm going to try to get something up soon for my own Child's Play auction soon!